SHARK VALLEY, Fla. — A wood stork is hungry, trying to find its prey in the murky shallow waters in the Everglades. It silently moves, bill submerged as it sweeps the area for sustenance to no avail. But the wood stork is slowly becoming endangered in the Everglades. And, like the wood stork, many different species are now scarce, victims of environmental and human threats. The swampland marshes of the Everglades are home to many animals that are slowly becoming extinct. Yet visitors will be hard pressed to observe so many animals in their natural habitat. 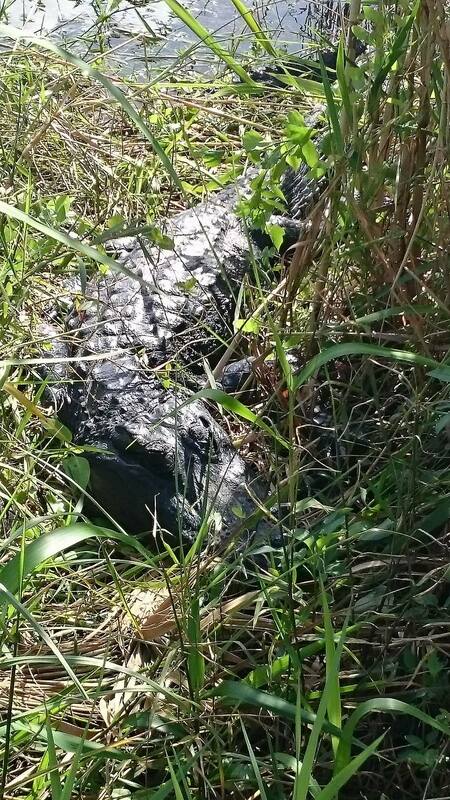 With the abundance of alligators, ibises and deer, there are also many endangered creatures. The Florida panther is so endangered that only a small number exist within the park and not many more can be found in the nearby Big Cypress National Preserve and adjoining areas. That is due to the park being threatened by many factors of the world. And the inhabitants suffer alongside it. The “River of Grass” was the name given by conservationist Marjory Stoneman Douglas in the 1940s. It is aptly named because the world-known destination park has a diverse collection of plants and animals. There are just endless scores of sawgrass wherever one walks and visitors quickly surrender themselves to nature and blend in with it. The beauty of the “River of Grass” makes the Everglades a must-see destination (Photos by Marcus Lim). With a bedrock of 100,000 years old and overlain by 6,000 years of sediments, the gentle sloping landscape is being affected by the recent changing sea level that exposes South Florida. This subtropical region’s only source of water is the rain that falls on it. However, extensive canal and levee systems stutter much of the life-giving water from reaching the park, causing less water to nourish the habitat of the wood stork and others. Effecting the nests and eggs prevents newborns from hatching and dispersing fishes is limiting predators, like the wood stork’s, food supply, threatening the ecological system of the park. Furthermore, pollutants from agriculture and other human activities add to the problem. 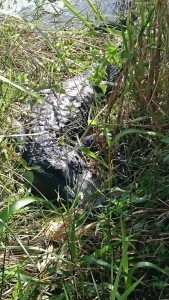 Alligators are common in the Everglades. High levels of mercury can run rampant if the creature at the bottom of the food chain has mercury. A Florida panther found in 1989 had mercury levels that were considered toxic to humans. Despite holding three world designations of International Biosphere Reserve, World Heritage Site, and Wetland of International Importance, Green is afraid that with the recent changes and pollution, that may not last. “I wonder how much longer the ‘River of Grass’ will be an appropriate description,” she said. Though facing it’s fair share of problems, the iconic park is considered a grassland wonderland by those who appreciate nature. 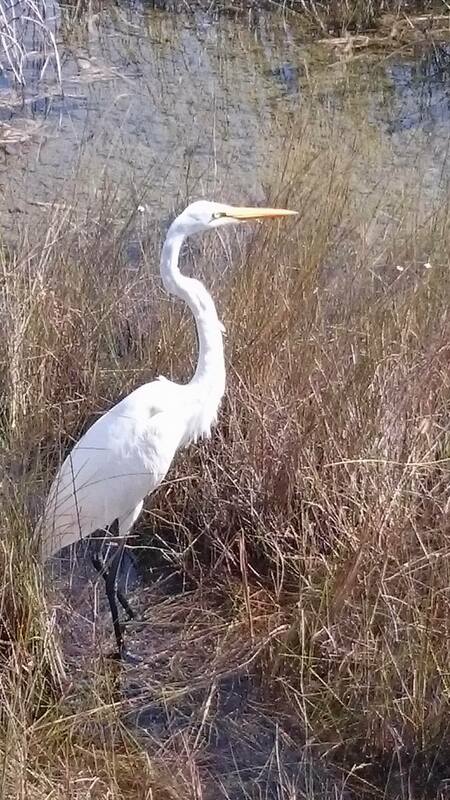 A white heron wanders the wetlands of the Everglades. 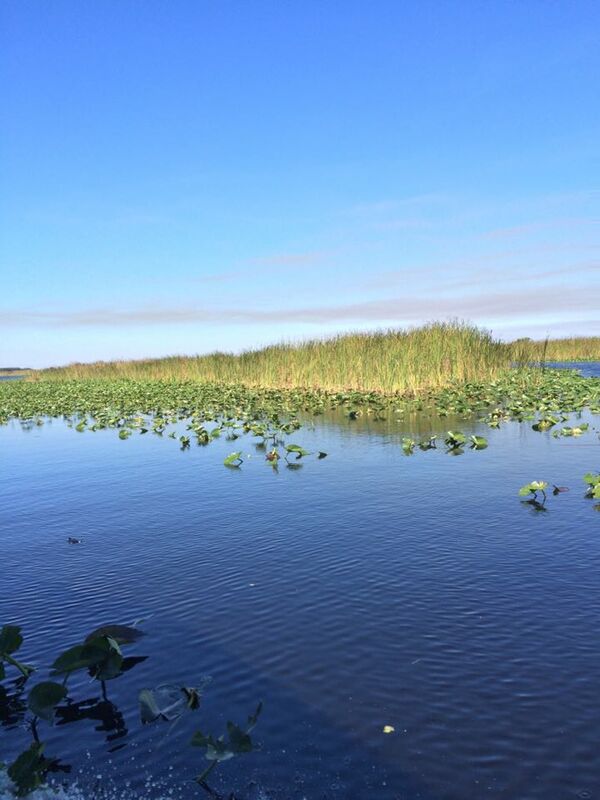 The Everglades region itself begins south of Disney World and meanders more than 200 miles to the tip of Florida. The park is a subset of that area, beginning south of U.S. 41 as it crosses the peninsula. This is the first national park created to protect a threatened ecological system. Created in 1947, its future depended on a healthier, more naturally functioning ecosystem in the entire region. In addition to the problems of nature, the burgeoning human population on either side is another headache, as it thirsts for the same water that most of the Everglades inhabitants need for survival. The rapid population growth of South Florida sees the humans competing with the national park for the finite water supply. According to statistics provided by the park service, 800 people move to Florida each day with 39 million people coming for a vacation each year. The park feels the population pressure. Stephen R. Shelley, vice mayor of Homestead, provided statistics on what the national park was competing against. Added square miles of building and paving also reduce rainwater penetration into aquifers, which stores water below ground. 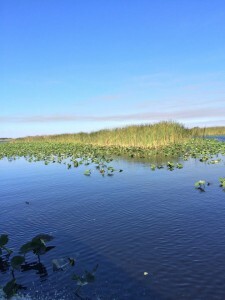 The problems with the distribution of water ripple throughout the Everglades causes the numbers of wading birds in the Everglades to decline by 93 percent since the 1930s. There used to be 265,000, according to the park service, yet now there are only 18,500. The wood stork is one of them, added to the federal endangered species list in 1984 due to the ecosystem changes. It feeds on touch by placing its beak into the muddy waters. It sweeps its bill side-to-side hoping to find fishes. However, due to the water manipulations, there are not enough fish to provide the 440 pounds that the stork requires in a breeding season. Furthermore, the upset in a natural wetland cycle causes the wood stork to fail to nest successfully. It is thus that the wood stork serves as an indicator species for restoration of the ecosystem. 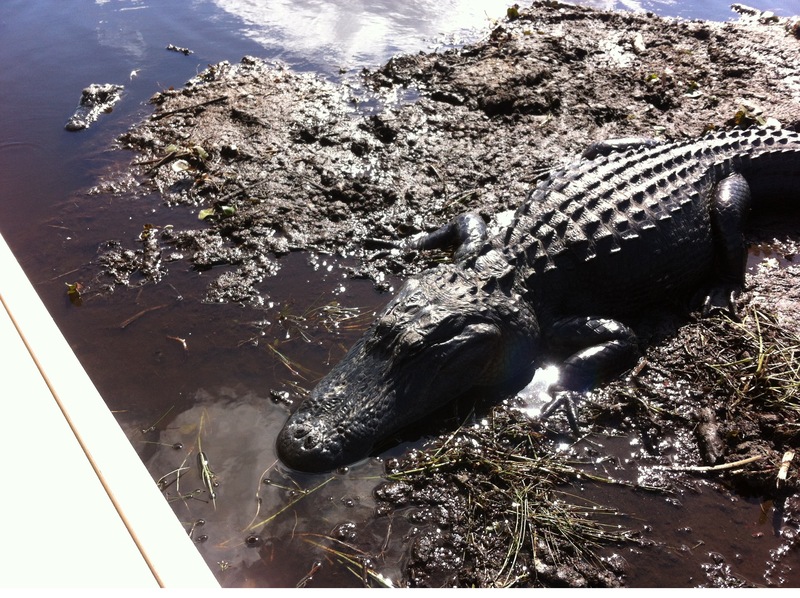 While the more than 350 species of birds in the Everglades have taken a huge hit, the other creatures of the park also felt the brunt force of humans. Alligators eggs are threatened by water level manipulation. Urban development and pollution from farms have destroyed the homes and lives of many animals within the park. This has brought the Everglades onto UNESCO’s World heritage in-danger list. Despite human destruction threatening the welfare of animals, the creatures wandering the park seemed impervious to the outside knowledge, though their numbers dwindle. Their standing is testament that nature will not bow down to outside forces, and for anyone lucky enough to see the various species, they can marvel at South Florida’s beauty of the Everglades.